Plasma Ruggedized Solutions is a known innovator and industry leader. We are proud of our solutions to different problems throughout sixteen industries. The following whitepapers demonstrate our excellence and expertise. Plasma treatment: Technically sophisticated material applications that provide critical protection against environmental threats to performance. How it works. Why you should do it. 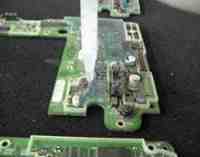 Corrosion is the number one environmental threat to electronic devices used in modern day national defense. Parylene is the trade name for para-xylylene, a material with unrivaled chemical resistance, dielectric characteristics, and moisture barrier properties. With the world's electronics use growing, Parylene's capabilities can apply across industries. Plasma Ruggedized Solutions is the industry leader in conformal coating services, parylene services, and other solutions. If you see a situation above that matches your challenge, contact us or request a quote today. We are confident that our team of experts can take a custom approach to any issue that you have encountered.